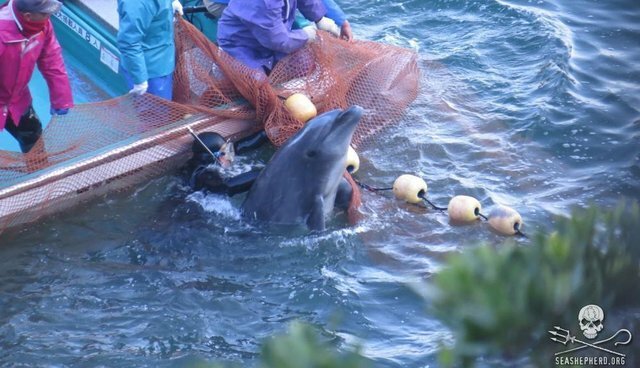 On Feb. 13, thousands of people around the world are joining their voices together in a call for compassion for dolphins being brutally captured and killed in Taiji, Japan. On the eve of Valentine's Day, Sea Shepherd Conservation Society's second annual "World Love for Dolphins Day" bringa the world's love and reverence for dolphins to "Japan's doorstep" at Japanese embassies and consulates across the United States and overseas. Last year, people gathered in cities around the globe to participate in the first "World Love for Dolphins Day," helping Sea Shepherd and Sea Shepherd's Cove Guardians draw international attention to the annual drive hunt in Taiji, which claims the lives of as many as 2,000 dolphins and small whales each year, depending on the killers' self-allocated quota. This year, Sea Shepherd's event are even larger, as Sea Shepherd USA chapters and volunteers across the world are holding 32 peaceful demonstrations across the US and in countries including Australia, Denmark, Spain, New Zealand, Ireland, Brazil, Hungary, Canada and Chile. Celebrity Sea Shepherd supporters and special guests are helping shine a bright, global spotlight on the atrocities committed against cetaceans in the cove. In Los Angeles, Sea Shepherd is joined by three celebrity supporters who have even joined the Cove Guardians on the ground in Taiji to witness and document the hunt firsthand – actress Shannen Doherty, best known for her roles on the hit television series "Beverly Hills, 90210" and "Charmed"; Sam Simon, co-creator of "The Simpsons" TV show, noted philanthropist and sponsor of the Sea Shepherd vessel named in his honor; and Simone Reyes, star of Oxygen TV's reality series "Running Russell Simmons" and newly appointed Director of TV Development, Def Pictures Television. Also participating in the LA demonstration are actors Eric Balfour, star of the hit television series "Haven" and Ross McCall, star of the HBO miniseries "Band of Brothers" and USA Network's "White Collar." McCall traveled to the Faroe Islands last summer, as part of Sea Shepherd's Operation GrindStop 2014, opposing the mass slaughter of pilot whales and dolphins known as "the grind." I am also standing alongside my fellow Sea Shepherds and supporters in Los Angeles, in solidarity with our brave international team of Cove Guardian volunteers currently on the ground in Taiji. This season I was denied entry to Japan to document the brutal drive hunt for what would have been my fifth season on the ground at the cove, as Japan continues its unsuccessful efforts to hide Taiji's cruel capture and slaughter of cetaceans from the world. Sea Shepherd and I hope that you are joining us and Sea Shepherd's Cove Guardians as we stand up and say, "Dolphins do not belong to Japan." Please see below the list of official, confirmed "World Love for Dolphins Day" events in the United States and overseas. Please note: Any locations outside of USA territory are to be considered "unofficial" Sea Shepherd Conservation Society (SSCS) events organized by local volunteers and will NOT involve Sea Shepherd Global or other Sea Shepherd entities outside of SSCS/SS USA. * Please note that this event is taking place on Feb. 14.